As 2012 election season is on us, Republicans of all sorts keep harping on the need for government to reduce spending (at the very extreme Ron Paul would eliminate $1 trillion in fiscal spending!) in order to “balance the country’s budget”. 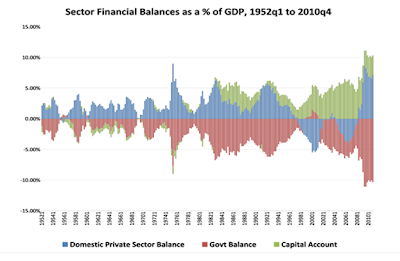 Said another way, domestic private sector balances (I-S), government balances (G-T) and foreign sector balance (X-M) cannot all be positive. 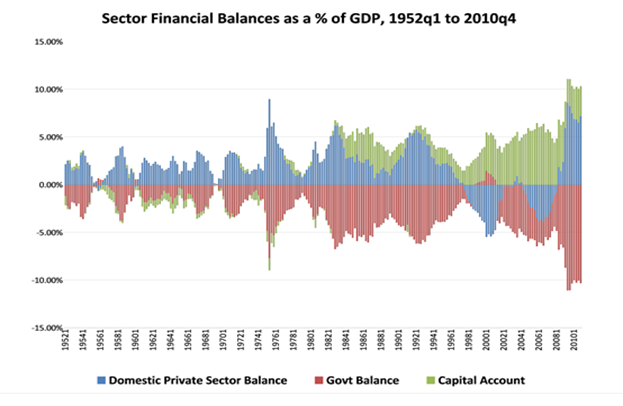 Indeed, if the US private sector (households and businesses) want to save, as they are doing so now under the burden of overleveraged balance sheets, and the US almost always runs a current account deficit (as the largest importer of goods and services in the world, also as a direct function of having the world’s reserve currency but that’s a topic for another day), the ONLY way for accounting identity to hold is that the government MUST run a deficit to accommodate this requirement. Looking at the attached chart for the US over the past 60 years confirms this (watch the changes prior to and after 2008 carefully). Over time, we will look at other conditions and constraints that are attached to this basic accounting identity (before you ask, no, the US government cannot run deficits into eternity without other consequences! ).